Six-part crossover between Valiant Comics and Image Comics published in 1993 and 1994. Instead of issue numbers the issues have different colors (Yellow, Blue, Black, and Red) and there is no particular reading order except for the bookend issues Deathmate Prologue and Deathmate Epilogue. 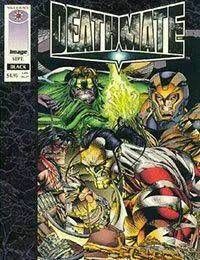 The story features Solar and various Valiant Heroes on one side, and characters from Cyber Force, Gen 13, Youngblood, WildC.A.T.s, andSupreme on the Image side. The crossover suffered from scheduling issues as Image released their issues 6 months late.